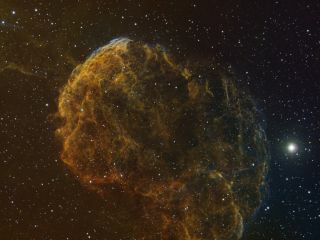 Also known as the Jellyfish Nebula, stunning IC443 is roughly 5000 light years from Earth in the constellation Gemini. Astrophotographer Bill Snyder snapped this photo from Connellsville, Pa., on April 2, 2012. Like a jellyfish floating in deep space, the supernova remnant IC 443 appears in serene beauty in this night sky photographer's amazing view. Astrophotographer Bill Snyder captured this photo from his home observatory in Connellsville, Pa., on April 2, 2012. Also known as the Jellyfish nebula or Sharpless 248, IC 443 is in the constellation Gemini. It is roughly 5,000 light years from Earth and resembles a jellyfish dragging its tentacles deep in the ocean. A light-year is the distance light travels in one year—about 6 trillion miles or 10 trillion kilometers. The emission nebula is the remnant of debris from a star that exploded many years ago. The resulting debris is comprised of oxygen, hydrogen, and sulfur atoms which can give the nebula its blue, green and red colors. The nearby Crab nebula was created the same way making it appear as if the two creatures were floating through cosmic waters.